If youre running an affiliate program, you need to pay your affiliates every month. Your affiliate script or system probably generates a list of payments to be made, but unless youre really lucky, it will not help you to actually make the payments. Many affiliate programs are now making payments via Paypal, as a quick and easy way to transfer money. 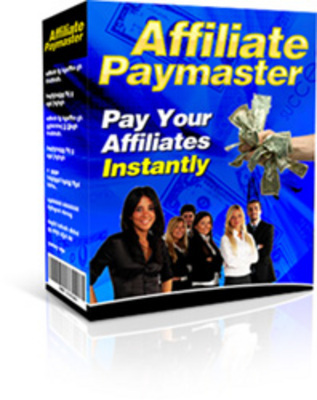 If you are already doing this or are considering this, you will love our special Affiliate Paymaster software. Paypal offers a facility called Mass Pay, designed for making lots of payments, however this is not available in all countries. For many marketers, it can also be quite daunting to use as this is a rather technical system which transfers large sums of money to lots of different people automatically. The alternative is to pay each person, one at a time using Paypals Send Money feature. This is of course slow and its very easy to make a costly mistake. Affiliate Paymaster is a brand new, easy to use Windows tool which automates making these payments for you, saving you time and effort, while reducing the chances of making expensive mistakes. Just take the list of payments generated by your affiliate script and paste it into the box on the software. Enter the name of your affiliate program and click the button. Affiliate Paymaster will instantly show a payment page like the one shown below. As you can see, for each payment to be made, the page shows details of the payment and a Paypal pay now button. To make your payments, just click on each Paypal button in turn, causing a web browser window to open at https://www.tradebit.com with all the payment details already set up. Just enter your Paypal password, click the confirm button to make the payment, then close the web browser window to move onto the next one. As each payment is made, a red tick appears next to it, ensuring that you do not accidentally pay someone twice. Your entire payment run is completed in a matter of minutes, making the whole process quick and painless. Affiliate Paymaster is compatible with any affiliate script or system which creates payment data separated by commas, tabs or spaces and it doesnt care what order the data is in (it will sort it out automatically). This means that it will almost certainly work with whatever script or system you are using. This simple software can save you so much time, effort and hassle, not to mention substantially reducing the scope for costly errors. Requirements The software is for use on PCs running Microsoft Windows. Affiliate PayMaster affiliate paymaster;pay your affiliates 110418030 8.95 secureconnect Fresh Download Available!